Sri Lanka is known as the pearl in the Indian Ocean. As with some pearls, there is a flaw – leprosy still exists on this island paradise. Although the Sri Lankan Government appears not to acknowledge there is a leprosy issue, a Colombo based charity is doing what it can to help those affected. SUROL (the Society for the Rehabilitation and Uplift of Leprosy affected persons) was founded in 1971 with the aim of helping those considered to be 'the poorest of the poor'. The Order of Saint Lazarus of Jerusalem has designated SUROL as a charity worthy of support. The Grand Priory of Great Britain has taken a lead in funding the work of SUROL and given financial assistance since 2011. The Grand Prior's visit in April 2014 was to witness first hand how funding was being utilised and ascertain how SUROL could be assisted further. 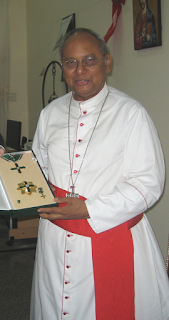 The Grand Prior's visit to Sri Lanka included a meeting with His Eminence Cardinal Malcolm Ranjith at Archbishop's House. The meeting was primarily about the work of SUROL and how the Church was playing its part in meeting the needs of those with leprosy. The Cardinal is pleased to be a patron of SUROL. In acknowledgement of his role, the Grand Prior presented the Cardinal with the insignia of Prelate Grand Cross of the Order of Merit. The award was given on the express wishes of the Grand Master of the Order of Saint Lazarus. In addition to the Grand Master's greetings, felicitations from the Chaplain General of the Order, Dominik Cardinal Duka, were also conveyed to Sri Lanka's Cardinal.